Where is your brand in today’s highly digital-driven world? It is becoming increasingly difficult to find new and creative ways to keep your social audience engaged while simultaneously attracting new followers. 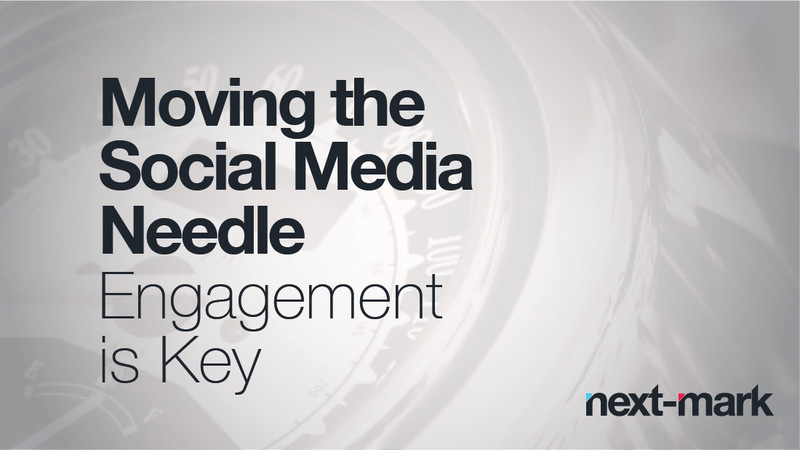 So how do you consistently move the needle on social media in both engagement and following? Here are a few learnings on “moving the social needle” based on our experiences here at Next-Mark. If possible, take a localized approach. This is especially important with large brands that serve a local audience. When a business caters to a specific community, it’s imperative to share content that is relevant to that location. This targeted approach will both increase followers and grow engagement. In managing and developing social media campaigns for clients, we strive to be consistent with content and include visuals with every post. Let’s be honest, the average person has a relatively short attention span so it’s important to hook them with something visually stimulating. Custom graphics, for example, are a great way to grab your reader’s attention. Enhance the customer service experience. It’s no surprise that people are turning to social channels with customer service questions. There is no reason your brand should not be addressing customer service concerns on your social networks. Not only does it drive to purchase, it also increases loyalty: 70% of those helped through social customer service return as future customers. Find, follow and build relationships with colleagues in your industry. It’s important to create and maintain a presence within your industry. You can do this by following related pages, participating in online discussions, engaging in social conversation, and sharing and re-tweeting relevant content. Give your followers a reason to come back. Consider offering promotions and offers available only to your social media followers. Offer fun and interactive contests and require users to “like” your page in order to be eligible. If you consistently give them fresh, new content to view, your readers will keep coming back for more! Need help building your social media presence? Maybe we can help! Feel free to contact us directly with any questions or inquiries.